I wrote a goofy story and made up a character called The Underpope. I thought it sounded like something goofy and fun to draw. So I did. 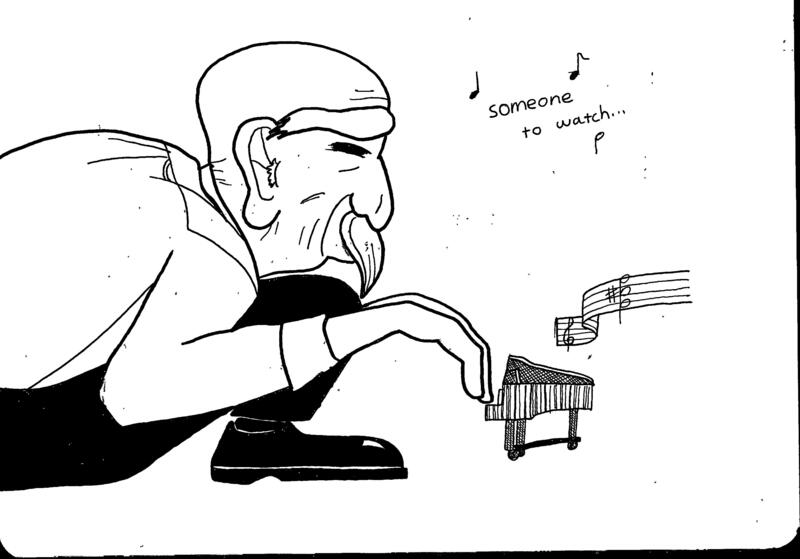 A friend asked me to draw a piano… I had a slightly different idea. Parents aren’t supposed to have favorites from among their children… But sometimes we can’t help it. Friends, this may be the most beautiful baby ever to have popped out of my oven. Especially compared to his siblings. I think I’ll eat him last. A page from my sketchbook – hence the big ol’ line down the middle. I’m pretty sure my dad loves me more than your dad loves you. That’s not to knock your dad. I’m sure your dad is nice. But my dad… he’s probably the best. So I did. The duffle followed me to college, where it sat for a couple of years until I got particularly peckish one night. I opened the bag up and threw everything aside that sat between me and the package of beef jerky I knew was inside. I left alone the unappetizing packages of freeze-dried chicken tortellini and pre-reconstituted turkey soup, and I went directly for the one sodium-laden snack I already knew I liked. After the jerky was gone, I figured the emergency kit was now completely useless to me. Still, I followed my father’s advice and lugged the bag with me from rat-hole apartment to rat-hole apartment. Even when I moved into my house, I carried the duffle with me without once pulling open the zipper to see what was inside. Last night, I was hit by one of those deep cleaning fits. You know, the kind where you take everything you own out of the place where it has stayed for months and move it to a completely different place. The kind where you don’t actually get rid of anything. Just when I was about out of steam for cleaning, I found the old duffle bag. I was suddenly seized by a fit of practicality, and I opened the bag to clean it out. I figured most of the military rations had probably gone bad, and so I was primarily concerned with getting rid of expired food. This time, with no beef jerky to distract me, I focused on the bag’s contents. I found a folding knife, serrated and still sharp. I found flashlights and batteries. I’d never even bought a flashlight for my house since I’d moved in. I found a blanket, which doubtless would have kept me warm in the event of a cold night without heat. I found ponchos, emergency blankets, and waterproof matches. I even found a travel version of the classic game Battleship and a deck of face cards with Mickey Mouse pictures on them. What’s more, I found cobwebs, and I found hundreds upon hundreds of discarded insect exoskeletons, symbolizing roughly ten years where nothing particularly dangerous happened. And yet, if it had, I would have had warmth, food, water, tools, and even some light entertainment. In a disaster, I would have lived like a king, and I hadn’t actually done a thing to prepare for it. But my dad did, which is pretty cool, if you ask me. I think I’ve finally figured out why people get tattoos. Tattoos are stickers for grown-ups. When I was a kid, if I ever got one of those coloring books with a sheet of stickers in the back, the stickers would immediately become my highest priority. You can’t just put stickers on any old thing. No, stickers have to go on something important. And then you remember that grown-ups don’t get Trapper-Keepers, and this thought makes you sad. So you do the next best thing. You get the picture inked﻿﻿ on your thigh.